First of all, this is all too worryingly drinkable at 60.1%. But, a little experimentation here is a rewarding thing. 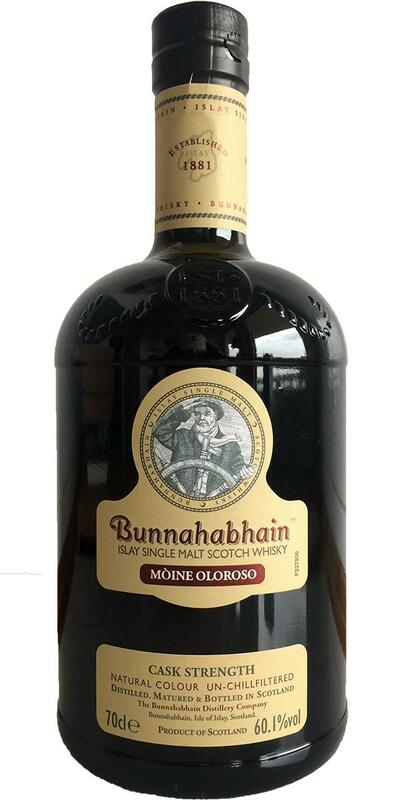 It’s almost always worth playing with water to see how it influences a dram – sometimes the effects can be quite marked – as is the case with the Bunnahabhain Moine Oloroso. So marked in fact, I find it almost like drinking two very different drams. There’s great balance achieved here between the Moine spirit and the dry sherry from Oloroso casks – it works surprisingly well in producing a dry punchy whisky where neither the sherry, nor the smoke feel like they’re overdone at all. Water changes the complexion of this whisky entirely and whilst you arguably some of the careful balance, the experience is transformed entirely across all aspects of the tasting experience: different mouthfeel, different sweetness, different smoking etc. A highly recommended experience. Go out and buy a bottle. In fact, buy two. This is crackerjack. Eating treacle tarts whilst sitting by smoking machinery. Smoke is immediate and is sooty and ashy and very ‘engine room’ (I seem to find Bunna’s Moine this way a lot of the time). Sitting directly alongside this is a huge treacle and toffee hit from some serious exposure to quite active Oloroso casks. There’s an almost meaty note which tastes like animal hides and leathers, and a fair amount of dried berries and incredibly overripe bananas here. Meaty and fruit – like a whole meal in one! A hint of earthiness tied to the peating, and the slightest touches of coffee, chocolate and polish. With water added (we were always going to be trying that when starting at 60.1% ABV right?) the smoke becomes less prevalent, but more pungent – a dirty and salty peat now – and the dried fruits come out to play more. It’s a very different dram in fact. Rich and pretty viscous. It’s certainly ‘clingy’ on the palate, though not immediately tannic per se. Leathers again with raisins and heavily spiced toffee apples. There’s a real pepperiness running throughout the experience, which when combined with some sweetness from demerara sugar makes for quite a lovely balance of sweet vs bitter. With water added the bite of the 60.1% is reduced, but somehow only moves us away from viscous to a rather ‘chewy’. Oak spicing is enhanced with some maritime-esque salts coming through and a very intriguing chalky taste which is both cold and metallic. Again, water transforms this dram into something rather different. Fairly long finish which is slightly astringent and drying and favours the peppery oak spicing notes. Water doesn’t seem to alter the flavours of the finish but does reduce its length. Hui, I like it. 60 turns that I can enjoy undiluted. And that for a NAS. Rather unusual. Very spicy with herbs and a bit of licorice. Water does not do the colleague good. To me no sulphur - and I am usually quite sensitive to this and I wouldn't like it. Any of the sulphur guys want to get rid of a bottle? A truly sophisticated whisky, which tastes me right down the line. He is furztrocken, but not too dry, since he is accompanied by a subtle always blazing in good time sweetness. He is reminiscent of an elegant salon evening in good lady accompaniment. The finish is demanding, eternally long and clings to the whole mouth that he chalant fills with pleasure on the highest level. I have a 94 for it. The already restrained sweetness decreases, while the bitterness increases significantly. Then pipe tobacco, the sweet sherry is again sweetish clear, in the end sees a noble eternally long-lasting bitterness, as if you had high-quality dark chocolate with high cocoa content (90%) would have eaten while enjoying a noble pipe, or cigar. Another amazing Bunnah. You have to tame it to fully appreciate it. Very red fruits and dried fruits, but where is the peat that was boasted? It hides behind, a very light peat. Well, here it is the mineral peat. Light attack then it rises crescendo on spices and leather ... it explodes clearly in the mouth. Average on coffee, cocoa, spices. My peat disappears little by little. Super gourmand, chocolate pulling slightly towards the coffee. The peat, imperceptible at first, rises slowly but surely! A little grilled ham. Very big attack spicy (peppered), leather, chocolate, wood. Very beautiful equilibrium with peat! What intensity. Intense but without violence. Leather and ashes. Diesel smoke and engine room - I did not have such extreme notes, as I could read them several times before, but this Bunna already serves a few extremes and there are also flavors that I found less beautiful. I like whiskys with rough edges, but here the will to be impetuous seems to me a little too exaggerated. I especially miss the subtle and unobtrusive complexity that I love about Bunna so much. And despite the accentuated Oloroso storage and the dark color, this is not a smoking sherry bomb, the overall picture is clearly dominated by the pale bitter smoke and a beautiful dark and very complex sweetness. Rarely did I need so many dams to approach a whisky. Patience is worth it, although there must be deduction of points for the initially unclean nose, the lack of complexity on the palate and the surprisingly short and uneventful finish. Mild mineral-metallic smoke, a bit of sulfur, tar-smeared rubber boots ... Pooh, - through this harbor thicket nose first has to work through ... but then very nice spicy sweet wood notes, sandalwood, cedar, very dark Demerara sugar, fresh coarsely ground pepper , baked salt crust, fresh tobacco, strong salt caramel, fruit notes I have only really very discreet in the nose, I could not explain exactly. Warming he slides down the esophagus, palate and throat are covered with cold ashes, I take a fugitive sweetness still true, that's it but then already. This whisky needs a lot of time to open up. I left the bottle open for about 12 hours to get rid of the sharp edges of alcohol. I even decant the whisky in an other bottle just for the whisky to breath. But after that the whisky was absolute beautiful. Nose: old oil, nuts, figs, steaming engine room, lightly smokey. taste: Oily mouthfeel, figs, choclate, nuts and that light smokeyness. Finish: medium long, on figs, nuts with a light bitterness. After the breathing this whisky reminds me of the fill your own Moine last year at Bunna`s open day, just perfect!